Practical humidifier had good durability, is suitable to various places and help to moisten the air. 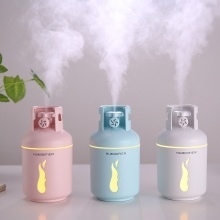 Large capacity humidifier can creat aromatic mist. With creative and exquisite appearance humidifier also has practical function. USB port is easy and convenient to use. Multifunctional humidifier also can be used as fan and night light. Once adding water can humidifying for a long time. Dropping the essential oil you like to make your room redolent. Suitable for bedroom, office, living room or in-car to moisten the air. Noise reduction with less than or equal to 30DB is enough quiet and does not disturb you when you are working or sleeping. Built-in smart core cuts off power after 6 hours which is safe.